The most obvious way to predict the immediate future of home sales would be to take a look at the list of homes that are under contract (pending home sales) and waiting for closing. 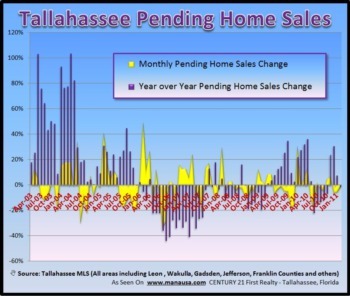 This list is what we refer to as “Pending Home Sales” and we can track them on a daily basis in the Tallahassee MLS. We feel so strongly about monitoring pending home sales that we include a monthly update in our Real Estate Newsletter, and this month we have acknowledged another trend change. The real estate graph below shows the one-year trend of pending home sales, so the changes that we see are not due to annual seasonality in any way (every point on the graph contains a full 365 days worth of information). With the tax credit ending as a stimulant to new pending home sales, this report unfortunately has shown immediate feedback. 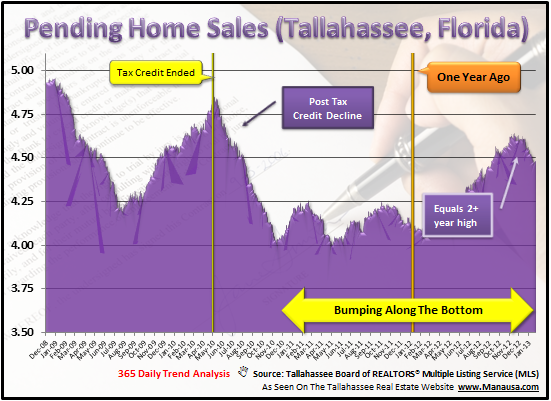 Beginning with the end of the Homebuyer Tax Credit, home sales had fallen and reached a new low on November 13, 2010. Since that new low, the market has experienced three upward trends and three downward trends. The current downwards trend is now about 3 months old. The real question is where will we go from here? I would think that falling home values and historic lows in mortgage interest rates are the primary reasons that we did not see a complete collapse of the housing market. The integration speed of distressed properties for sale is a delicate factor in how we will see the market move from here. As long as mortgage interest rates stay down, the consumption of distressed properties will allow the market to correct itself over time. Then, people who have sold for a huge loss will be able to buy-back into the market at very favorable prices, so we now must turn our attention to creative solutions for “damaged credit” buyers and “no cash” buyers who have just left the market as sellers. A solution for these ready buyers would restore the market almost overnight. But until we see a solution for them, this market is looking at several more years of a slowly accelerating housing market recovery. If you would like to know what the pending home sales that are similar to your home say about your ability to sell your home, just drop me a note and we can schedule a time to review your specific situation and needs. Interesting article and I know it must be based on the average of pending sales in all price ranges and the entire Tallahassee area, but it seems to me in the $100,ooo to under $200,00o range particularly in the 32317 Zip where I have been looking, there are a lot more sales pending now than 2 months ago, but there are still a lot of houses that the banks are sitting on. You are very observant Rich. That price range is doing well, while the higher points have really cooled off.